Theme: New Challenges. Creating Opportunities. GIA Symposium has revealed the discoveries, opportunities and insights that move business forward. 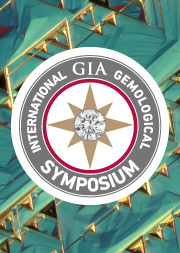 Offering expert presentations, panel sessions and networking opportunities, Symposium unites scientists and business leaders to meet the challenges facing the gem and jewelry industry. Scientists from around the world will present the latest findings in gemological research. Harvard Business School (HBS) professors will lead an exploration into Authentic Leadership, Customer Centricity and Disruptive Innovation using the famed case-study method employed in all HBS programs. Don’t miss this Industry must-attend event. Pala's own Bill Larson will be giving a lecture on mining in Southern California. He will be focusing on the history and challenges in the area. We look forward to seeing you all there! This month we feature a pair of grossular garnets with two distinct colors and two historic mines. The 12.63 cts emerald cut is highly saturated making it of the tsavorite variety. Pala bought this piece recently and it is reportedly from one of the original deposits near the Komolo Village in northern Tanzania. The yellow green hue, medium tone, and high saturation makes it a unique color. The size and precision emerald cut push it into the world class category. The 11.33 cts oval cut is considered a mint green grossular garnet. Not quite saturated enough to be a tsavorite but has a striking mint hue and a neon like glow. This mint garnet is from the famous Merelani area in Tanzania. Found along with the massive tanzanite deposits these grossular garnets are occasionally found in the same mine. Recently Pala has acquired a large number of fine red beryls. These stones came from an old estate and have been held from the marketplace for quite some time. Quality red beryl is extremely scarce in today's market and fetches a fine premium. The resurfacing of this red beryl lot is extremely exciting for us as we had sold out of our previous stock. As reported by the GIA, only about 10% of the some "60,000 carats" produced is facetable. The parcel is roughly 130 cts. Most of the stones are less than 1 carat in size.